A Dog Buddy Match is a peer to peer exchange between dog-owning neighbors who each have a complementary need, which is finding an effective solution to leaving their dog alone or indoors whenever they’re at work or at school every day. But, a Dog Buddy Match can be much more, just depending on the needs of each neighbor. For instance, let’s say you and I are neighbors who both work Monday through Friday. We both have nice, secured backyards, though yours has more trees, which offer a lot more shade during hot months, so we arrange for my dog to spend the day with your dog Monday through Friday while we’re both at work. The dogs get along great, and all is going very well when one day you tell me your job is going to start requiring you to travel periodically, so you ask me if I know of a good boarding facility for your dog. 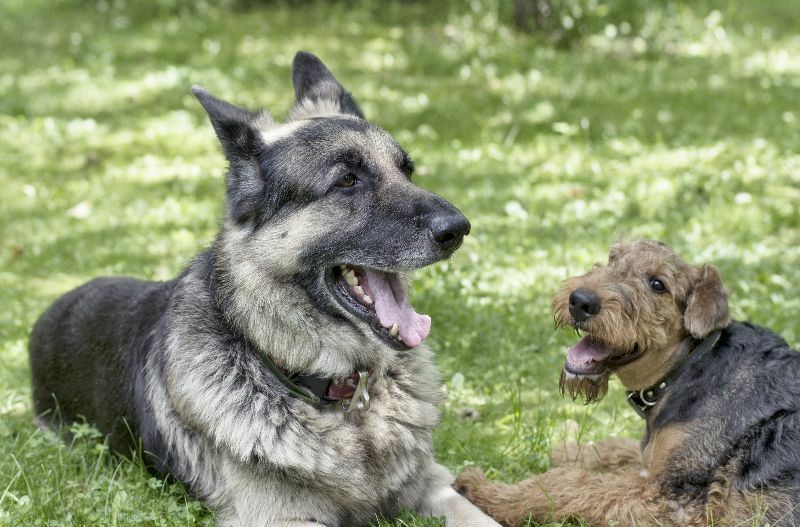 Because our dogs get along so well, and because I am so grateful that you let my dog spend the day with your dog five days a week, I offer to let your dog stay with me and my dog anytime you have to travel. You, of course, are thrilled to be saving the cost of boarding your dog, and I feel good because it feels like I’m able to offer a little something to show my appreciation for you letting my dog stay you’re yours every day, and because I know our dogs will really enjoy the extra time together while you’re away. Or it may be that as part of our Dog Buddy Match arrangement, we agree to not only have our dogs spend the day together whenever we’re at work, but that we also agree to dog-sit for each other whenever either of us goes out of town for annual vacations. Or let’s say you live in an apartment which has no yard, so your dog is stuck indoors all day. Meanwhile, my dog always tears up my back yard whenever I leave him home alone. My vet tells me he may have separation anxiety or perhaps he’s just bored being by himself in the backyard all day. So you and I meet at a local park with our dogs, the dogs get along great, and even more so when you bring your dog over and they romp in my backyard for the next 30 minutes. We decide that it seems like a good match and agree to give it a try. It works out wonderfully, and a few weeks into the arrangement, you tell me that you like to get up at the crack of dawn and take your dog hiking every weekend, and offer to take my dog along. Because I can almost never get up before 10 on the weekends, I graciously accept your kind offer. And we’ve taken what was already a win-win for us and our dogs, and made it even better. These are just three examples of what a Dog Buddy Match can be. It all depends on your needs and your neighbor’s needs. But, at its heart, a Dog Buddy Match is an agreement with a neighbor to share dog care responsibilities, all in an effort to increase the quality of the lives of the dogs involved, and in so doing, increase the quality of our own lives. All without ever spending a penny. We’re the first to admit that this is neither a new nor a completely novel concept, people have been sharing responsibilities for both children and dogs for years. Dog Buddy Match merely provides a free platform from which you can easily locate a nearby dog-owning/dog-loving neighbor and explore the possibilities of engaging in a Dog Buddy Match with them and their dog. Dogs are arguably the most social animal on the planet, and the average dog will spend more than a third of his or her relatively short life home alone waiting for the return of their owner. And, when there are so many who are alone, all within the same area, it just doesn’t make any sense that any of them should have to spend that much time alone. That’s why we created Dog Buddy Match, and it's what we’re all about.